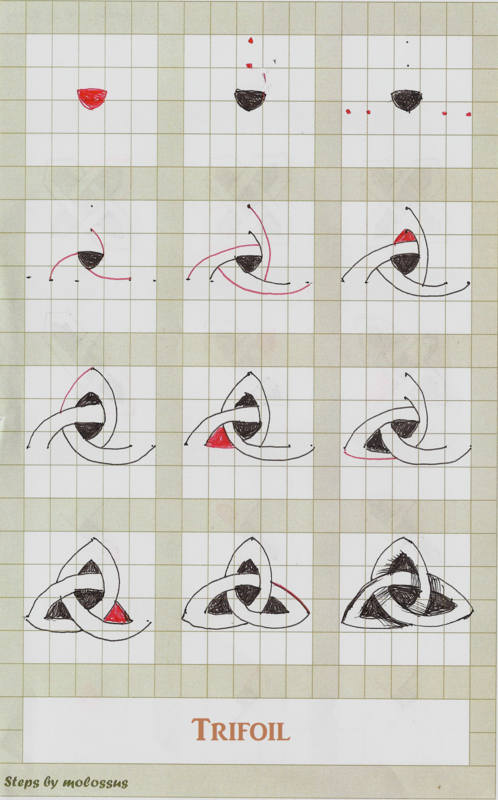 Based on feedback for Quaternary, it seems as though the steps were much easier to follow, so I decided I’d redo the other Celtic knots in a similar fashion. I’m trying to emphasize building the knot from inside out.When I do it this way, it feels to me like a song. A refrain, then the chorus, a refrain then the chorus. Or–maybe more like–the finger bone connected to the hand bone, lol. Anyhoo. I’ve filled in the negative spaces. It isn’t necessary to do that, but it is more visual for my purposes here, and I think it is a help in the beginning, to keep your oriented. I hope you find this helpful! Molossus..thanks for the redo. I think it is the grid paper that helped me get my perspective. I did get the trifoil the first time, but I kept drooping the left side, and finally had to put it on grids to figure out why. You rock! Thank you both! Who knows. Maybe someday I'll do a book, but I hesitate. It would take away from the time I'd be able to spend here!